Barely 10 knots of wind. Considering how it normally blows in the Leeward Islands, that was a crude joke. Yet Kiwi Spirit’s red, blue and white hull sliced upwind as if she were under engine. “Copy that,” the voice on the VHF responded. Then the boat went into a tack with all sails strapped in to give the camera crew a chance to race ahead. If that was a taste of the boat’s true performance potential, Stanley Paris definitely will have the wheels to beat the pants off Dodge Morgan’s 150-day ride from Bermuda to Bermuda around the great capes, which in 1986 was the world record for a solo non-stop circumnavigation. The latest monohull record stands at 78 days, and the fastest American to race solo and non-stop around the blue pumpkin is still Bruce Schwab, at 109 days, but that doesn’t matter to Paris. Like Morgan, he’ll do it in Corinthian fashion: self-supported and self-financed. Like Morgan, he’ll cast off late this fall from the U.S. mainland, from his hometown of St. Augustine, Fla. The oldest city in the country is celebrating its 450-year anniversary and supports this trip. Like Morgan, he’ll sail to Bermuda first, but when he passes the St. David’s Light out by the airport, the clock will start ticking. He says he wants to complete the voyage in 120 days — a formidable challenge, especially at age 76, so what gives? Aside from the skipper’s personal fitness, confidence and competence, the ace in the hole is Kiwi Spirit, a 63-footer designed and built to his multifaceted taste: a macho machine for the record and a cozy cruiser, relatively speaking, afterward. With more than 60,000 ocean miles in his wake and “enough knowledge to ask questions,” Paris took his dreams to Farr Yacht Design in Annapolis, Md. “In many respects their task was the most difficult, [to] combine racing with cruising,” he says. 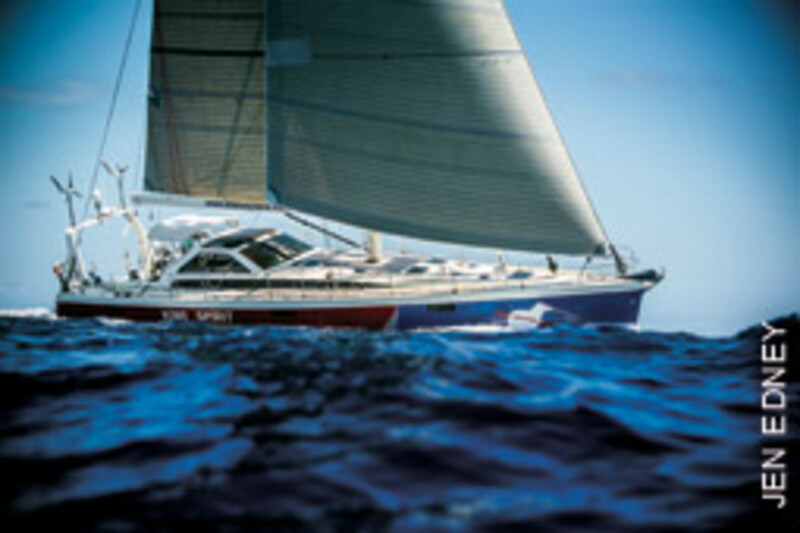 Like most modern racing monohulls, Kiwi Spirit’s hull includes chines. 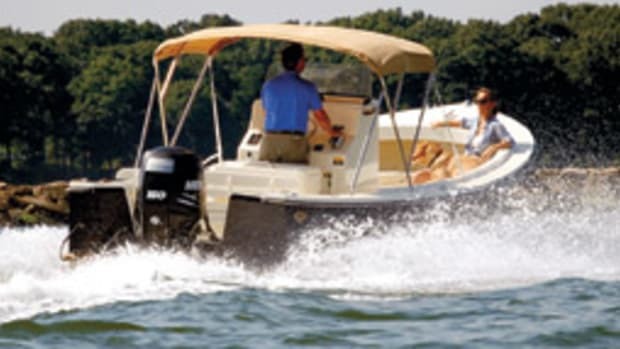 The boat also is equipped with twin rudders and a water ballast system with 530 gallons (about 2 tons) of capacity for additional righting moment and a cutter rig built from carbon fiber with headsails on roller furlers. In light air, Paris likes to fill the leeward ballast tank to induce heel and lessen the wetted surface area. 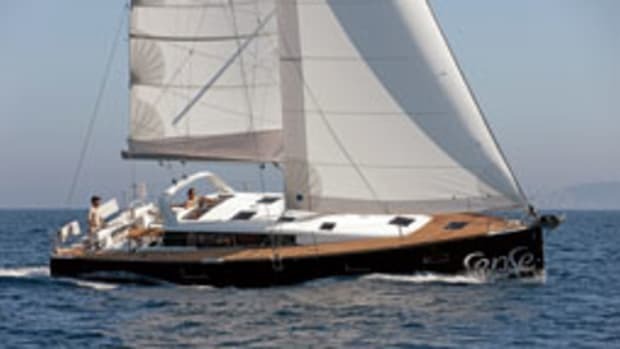 The yacht, which hit 27-plus knots during a delivery trip, according to Paris, betrays her cruising genes with a hydraulic lifting keel that slides up and down in a trunk, reducing the draft of the T-shaped appendage from 14 feet, 9 inches to 8 feet, 7 inches. 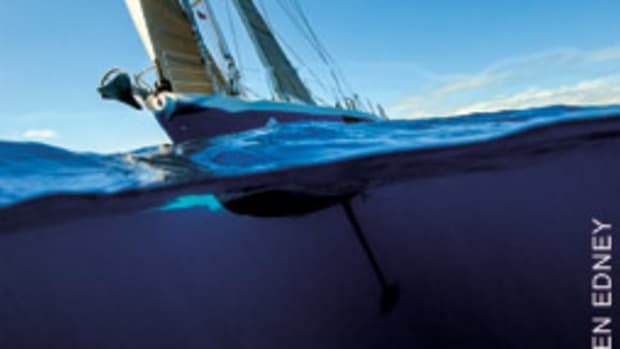 “Sailing at 100 percent of the theoretical performance predictions in our weather model, Kiwi Spirit could complete the circumnavigation in approximately 75 days,” Smith predicts. If Paris were to maintain 60 percent of that, he’d be sliding home in 120 days, no sweat. But sweat he will, even though the deck layout and the hardware configuration were conceived to reduce physical exertion by decreasing line loads, adding purchase on halyards and lessening friction on control lines that are led back to the cockpit, which is protected by arguably the sleekest hard dodger under the sun. Still, the grind was too much, quite literally so. Hence the decision to install electric winches for the record attempt rather than afterward. Driving the manuals with an electrical winch handle, as Paris tried, proved impractical. That means power generation and management on the trip will be critical. And that’s a big deal because Paris stipulated that all electricity has to come from renewable energy. Farr consulted with hybrid propulsion guru Nigel Calder and Vendee Globe race finisher Schwab to devise a system that includes two Superwind 350 generators, 15 SBM solar panels totaling nearly 900 watts of capacity and four Watt & Sea hydro generators on the stern (two of which can be deployed simultaneously), each producing as much as 500 watts of power at 8 knots of boat speed. 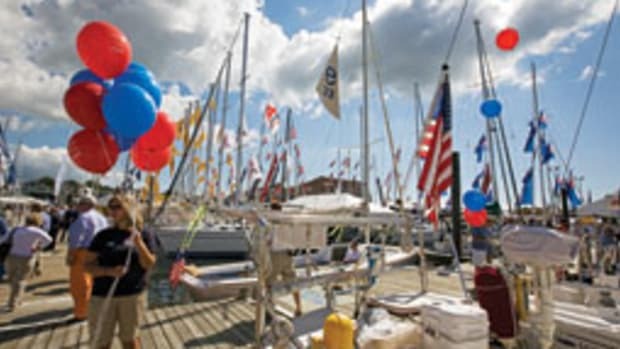 Building this boat was a big job for Lyman-Morse and a premiere, too: It’s the first Farr design that rolled out of the shed in Thomaston, Maine. 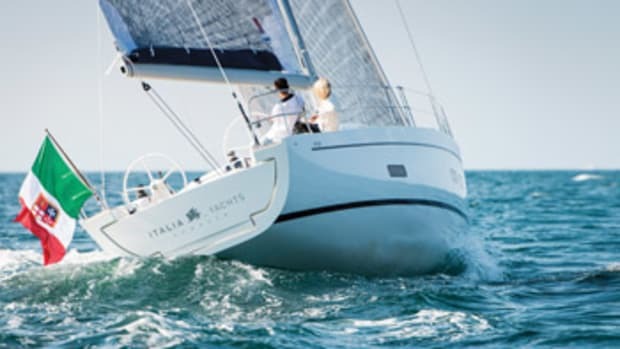 Built in sandwich construction from carbon Kevlar and E-glass that’s infused with epoxy resin and post-cured, Kiwi Spirit’s construction is on par with racing yachts. “The biggest challenge was building a multipurpose boat — light and fast, being able to sail in the high latitudes single-handedly before it becomes a full-on cruising boat with all amenities,” says company owner Cabot Lyman, a world cruiser himself. “It’s not as radical as an [Open] 60 or a 70, but it still is a racehorse you’d want to slow down in rough weather,” adds Cabot’s son Drew, the firm’s vice president. On a stem-to-stern walkthrough, Paris points out the boat’s safety features, which include a sacrificial bow that would absorb the impact of a collision with a submerged object and five watertight bulkheads that should keep Kiwi Spirit afloat in case of catastrophic damage. 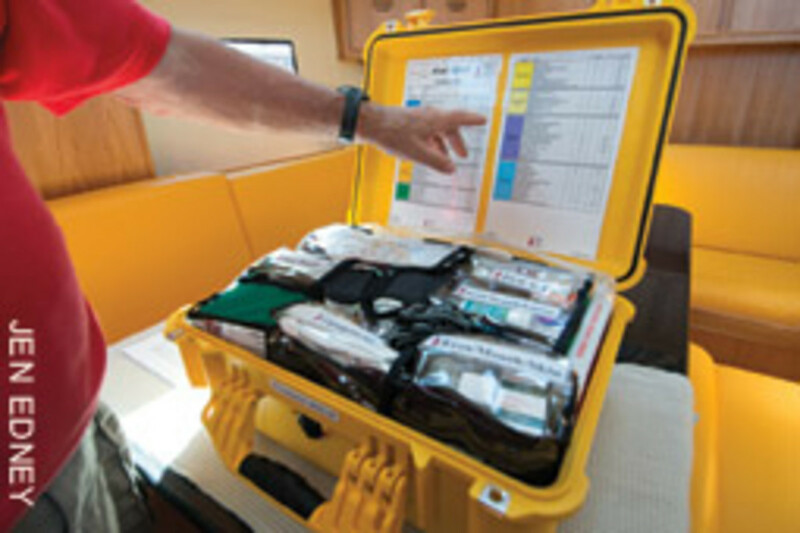 An extensive medical supply kit is tucked away in the bilge under the washer/dryer combo in the passage to the aft cabin, and a well-stocked liquor locker is tucked under the sole forward. There was a bit of debate between Paris and his now departed coach, Fred Boursier, about the emergency egress routine because the stern hatch in the aft cabin connects to the lazarette, which would have to be opened separately. 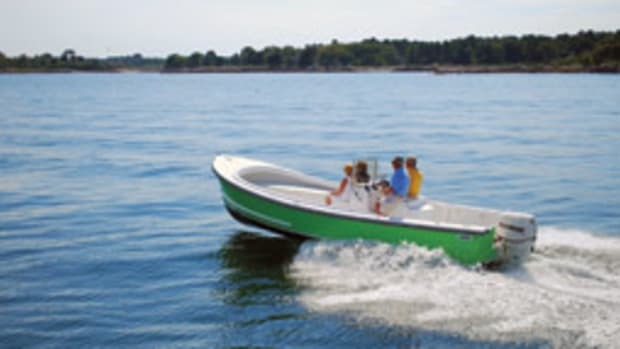 That could make an escape difficult if the boat is upside down and partially submerged. 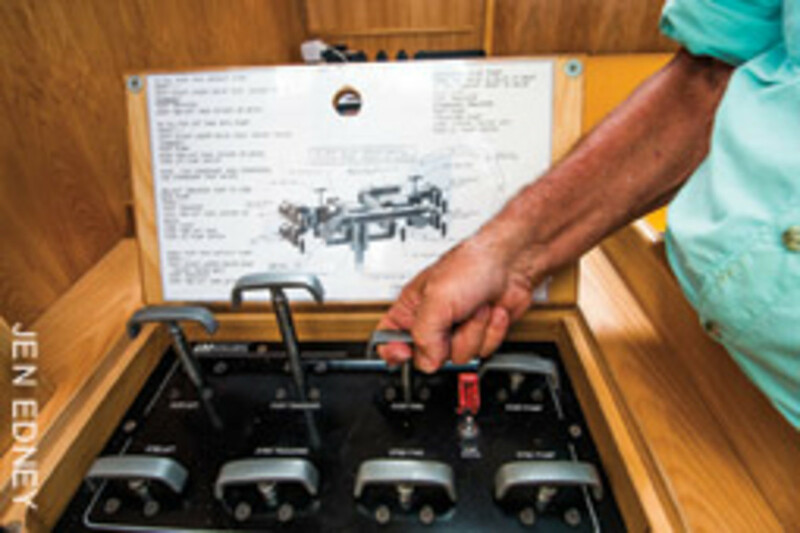 Smith argues that there’s a second hatch in the cockpit floor and that the skipper’s dwellings during the solo voyage will be in the saloon, near the companionway and the forward-facing nav station, which is a nautical version of Toys“R”Us. 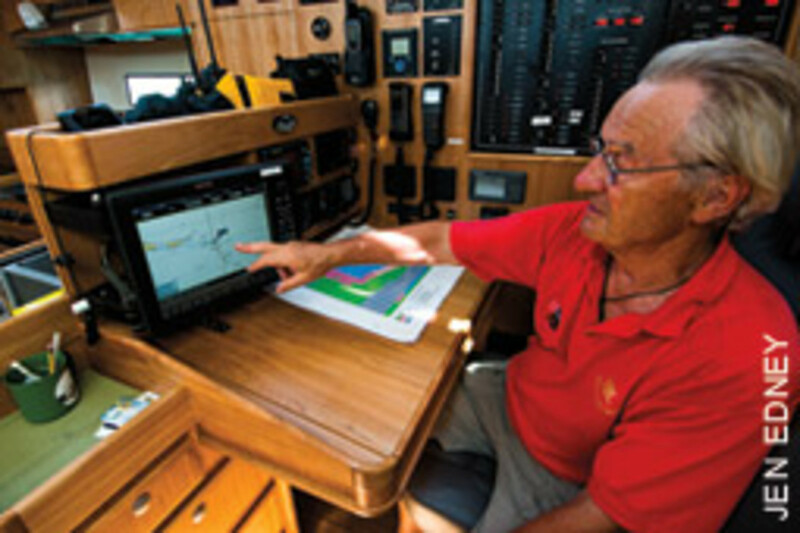 There, in an ergonomic captain’s chair next to the giant electrical panel, Paris will spend a good deal of his time — talking on the radio or sat phone, blogging, sending emails or monitoring the vitals of the boat and its surroundings on a large multifunction display that has a repeater in the cockpit. It’s high-tech, and it will put a robust demand on the sustainable sources of power. 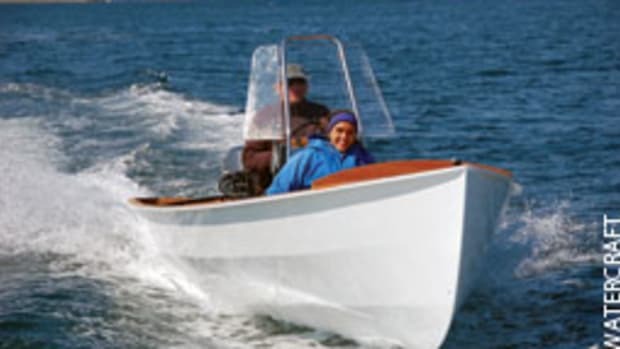 Stanley found that the boat “sails well, especially in winds above 8 knots. 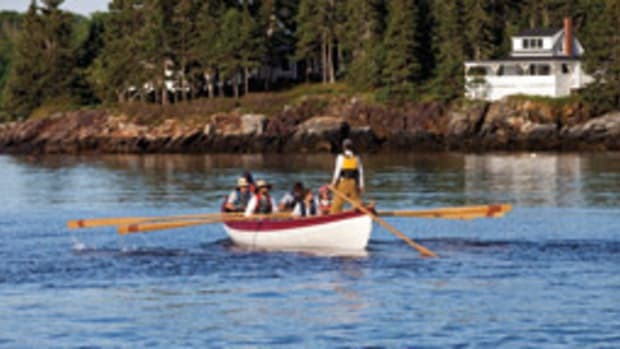 I was able to beat to Bermuda hard into the wind and waves, over-canvassed yet confident that all would be well,” he says. Next on the docket was the Marblehead to Halifax Ocean Race, before the boat was going back to Lyman-Morse for the removal of the interior and the final tweaks, which include adjustable boards at the helm stations to stand level at heel, moving the radar from the cockpit arch up into the mast, additional handholds, possibly a third autopilot and other redundancies. Assuming all goes to plan, Kiwi Spirit and her intrepid skipper will set out from St. Augustine in late November for the warm-up hitch across the Gulf Stream toward Bermuda. It could get bumpy there, so Paris won’t step on it, but he won’t slow down, either, to let a tardy photo boat play catch-up.